My husband definitely loves me…we had the perfect date night two Sundays ago. He took me to our favorite sushi spot, talked through some things for OH!, and then we went home and organized his side of our closet. Does he know me or what!?! 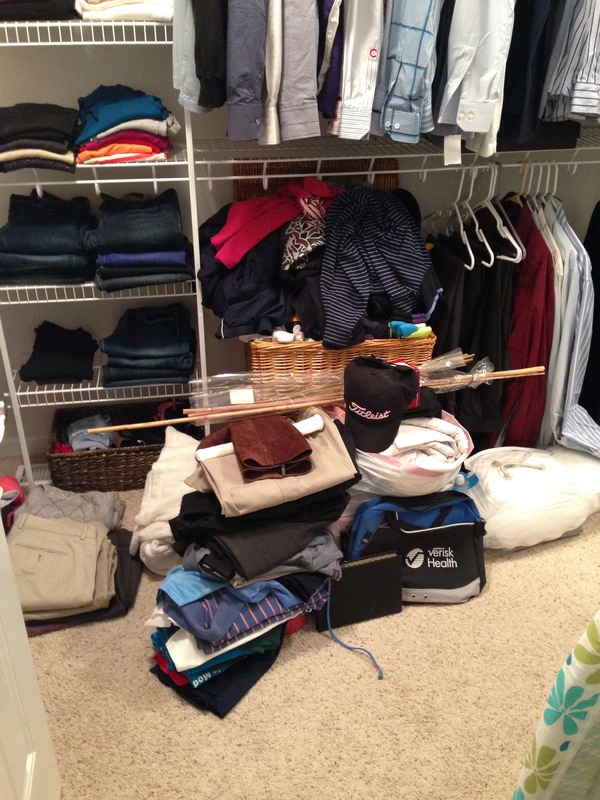 I try to let Jason’s side of the closet go for the most part – it is his home too. However there are times when he knows he needs some help from his “Organized Housewife”! 🙂 Piles had been accumulating since Christmas and it was migrating to my side, making it hard for him to get to his clothes and impossible to use our full length mirror. There were also more than a few items on the shelves that neither of us wanted him to ever wear in public again! 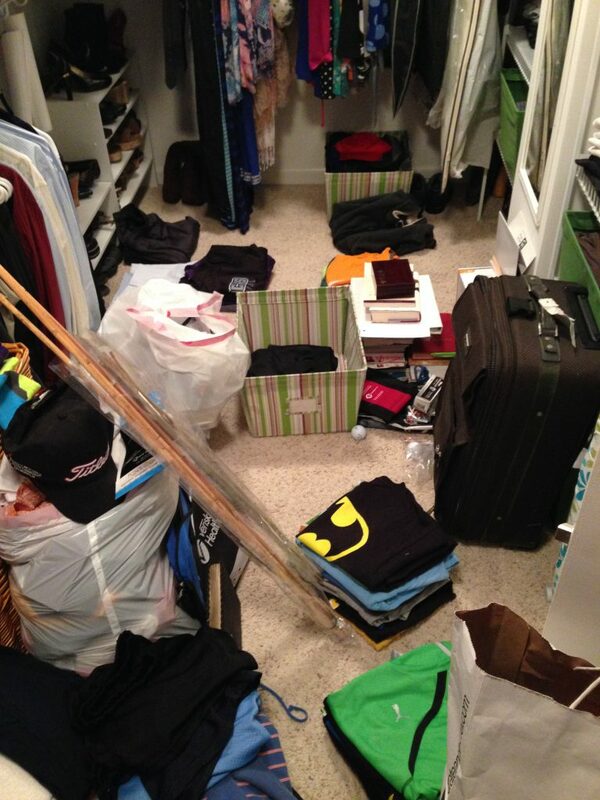 It is a little more difficult to organize with my husband than a client. I tread a little more lightly with him and try to let him “begin” the process. He started sorting t-shirts and did an awesome job of letting go of quite a few that he knew he’d never wear again. But how could I pause his sorting and purging!?! We pulled items from all of the shelves and bins of clothing, making a large pile of laundry, and an even larger pile for Goodwill! We continued by sorting through items on the floor, taking those Christmas gifts out of their boxes and all!!! By the time all of the sorting and purging was done, Jason was pretty done himself! 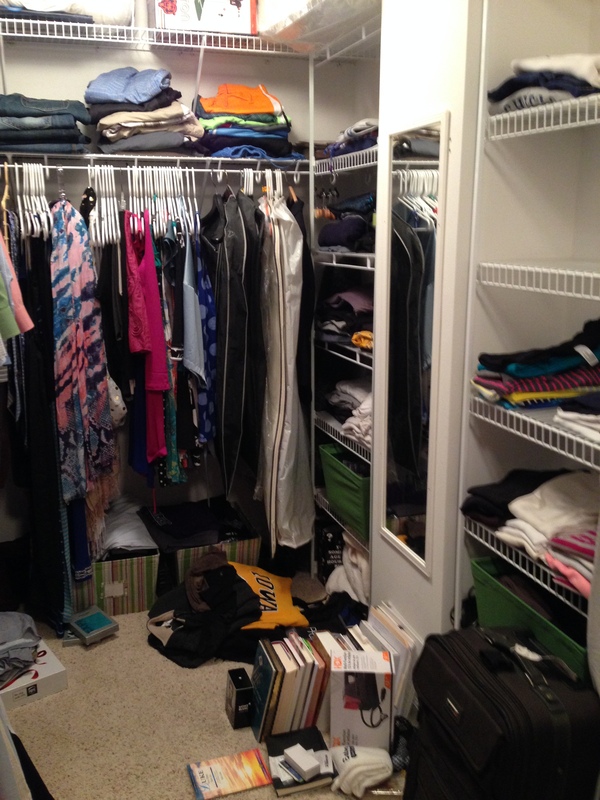 It can be fun for most of us to look through what we have, uncover treasures, and create space by purging. However, it is the remaining piles that can feel daunting! This is where I frequently take over for clients, and could tell I needed to do the same for My Love. 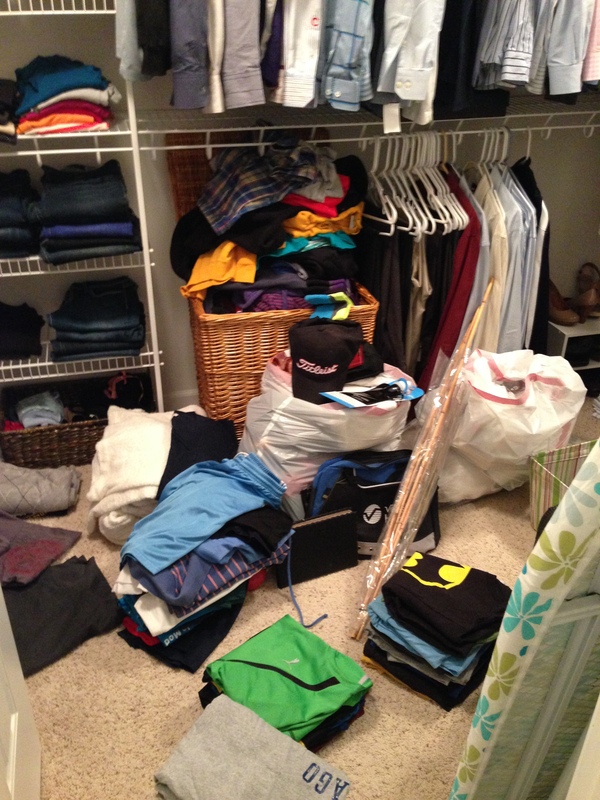 He had put in about an hour and a half of work and there were still major piles consuming our closet! We had a pile to relocate to the basement bookshelf, and garage sports storage…. And don’t forget that tower of laundry in the back! We called it quits for the night, knowing I could wrap things up the next day. I spent about 30 minutes the next day hauling things to their new “home”, dusting, vacuuming, and taking care of a few “readjustment” details. 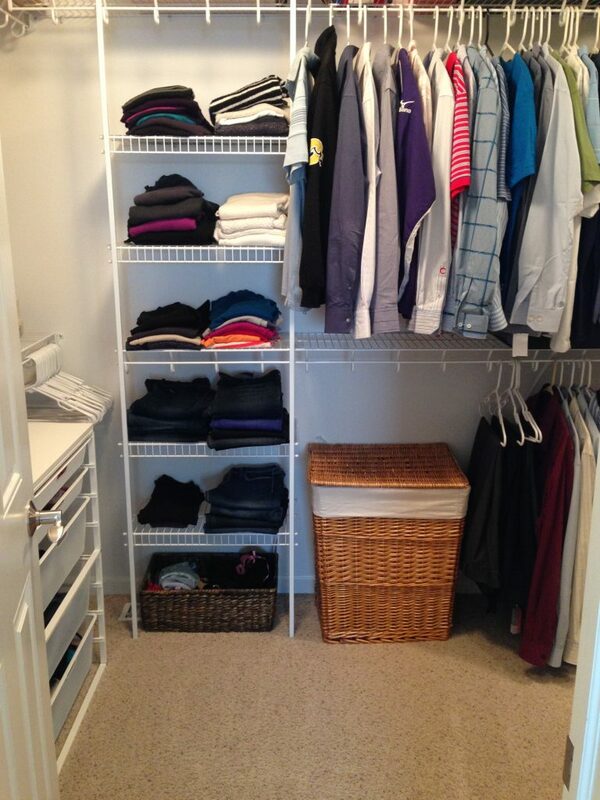 By the time Jason got home the closet was nice and orderly! I have to be real here and note that there were still some massive piles of laundry in our bedroom that took two days to complete! I can’t really blame that all on the closet condition though – I had been procrastinating routine laundry duties for well over a week! 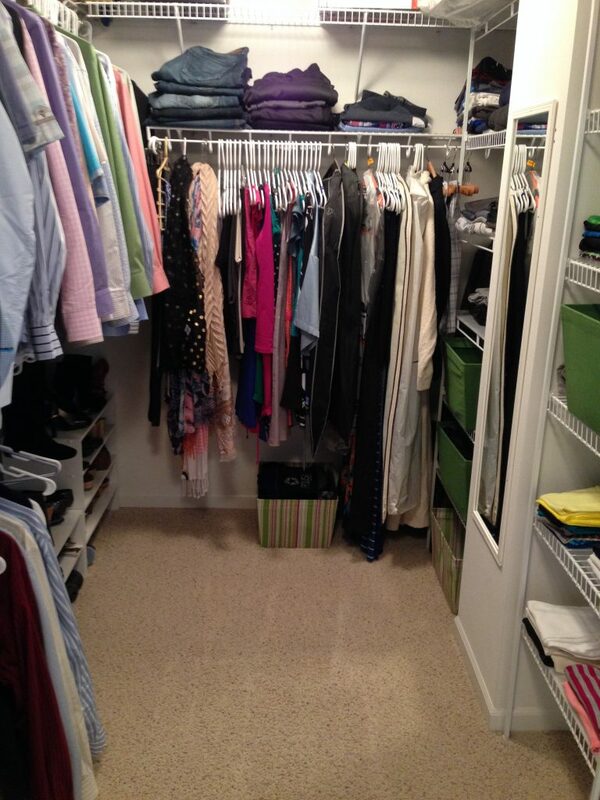 You can see that our closet is clean, organized and super functional. 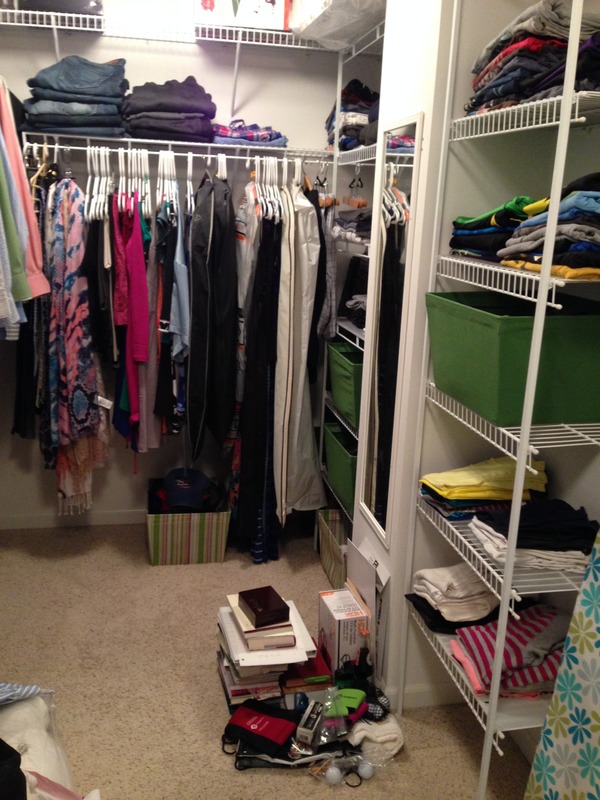 But notice… our closet is not color coded, filled with super cute storage pieces, or even “styled” at all. No one’s house is perfect if they truly live in it… for me, this is the right balance of function, order and aesthetics considering time and budget constraints. My side has a pretty jewelry display, a couple sentimental items and a card from my hubby that make it “me”, but it is all far from “cover photo ready”!